Walleye Fishing Article, When Walleyes Want Meat, Rig 'Em Up. Live bait rigging tips and techniques. Walleyes across the nation agree! There are times when nothing works better than live bait presented slowly and naturally. The tradition of live bait rigging for Walleyes has stood the test of time because it works! This simple, but effective "dragging of bait" continues to rank high on the reliability charts when it comes to putting Walleyes in the boat. Every summer Walleyes reach a phase where they’ll actively gobble up a hearty night crawler or active leech. But there are times when food supplies peak and Walleyes can pick and choose what, when and where they eat. At times like these, you could be missing the boat on some of the best fishing that this time honored system has to offer? Little changes in your approach to "rigging" can equal big differences in your catch. It’s time to take a fresh look at a few simple tips that will help swing the odds in your favor next time the Walleyes cry for MORE MEAT! The live bait rig is a simple setup generally consisting of a sliding sinker, swivel and single plain hook tied to a leader varying in length to suit the fishing situation. This is the same basic rig that can be found anywhere in the world and used to fish for almost anything that swims. By varying the weight and shape of sinker, size of hook and strength of leader this rig can be adapted to hundreds of fishing situations. Refinements of the basic rig could include items such as colored beads, hooks or sinkers. The rig could be adapted to make the leader length adjustable and sinker shapes can be adapted to perform in a variety of bottom conditions. No matter what the refinement, the job of a live bait rig is always to present a live bait such as a Leech, Minnow or Night Crawler to a fish in a way that will trigger the fish to eat that bait. Live bait rigging is perfect at times when fish gather along deeper drop off edges, mud flats or main lake, open water structures. Times where the fish can be spotted fairly easily on your graph or locator. Unlike "searching" methods that require covering water quickly such as bottom bouncing or trolling crankbaits, rigging is a more subtle approach that requires the angler to let the bait do most of the work. In rigging, speed kills. This method calls for a slow, deliberate pace that allows the bait time plenty of time to work. Even the liveliest bait can be sent tail spinning aimlessly if you move too quickly. The deeper you fish, the more important this rule becomes. Deeper water is usually a lot cooler than the shallows and live bait, especially leeches can tighten up into a ball and begin to spin. This is not attractive to a fish, because it’s not just the meat they want. The fish need to see that convincing action of a fresh, live bait. You can watch this as you first drop a hooked leech over the side of your boat. At first, the leech looks dead and unappealing. Given time, the leech will begin to swim and then becomes deadly bait for triggering fish. This is true for fresh night crawlers and minnows too. If you’re moving too fast, the liveliest minnow in the world can still look like just a piece of dead meat. Give them plenty of time to swim, wiggle and kick. This enticing swimming action is what will trigger Walleyes in these situations and it’s important to remember how much better these fish will respond to this enticing live action. Another concern when you’re deep rigging is that you keep the bait in front of the fish. This is so important, but often overlooked and it is simple if you remember to visualize where the fish are located on the structure and how high they are holding. Their location is what determines where the bait must be presented if you want to catch those fish. By varying the length of your leader, you can encourage the bait to ride higher or lower. Short leaders will stay near the bottom, while longer leaders will allow the baits to drift up higher. A good rule of thumb is to start with a leader of about 5 feet and experiment from there. Leaders of ten feet or more may be required to reach the "high riding" Walleyes that feed on schools of main lake minnows or swarms of insect larvae. At times when the fish are really riding high, you might replace your plain hook with a floating jig or add a small float to the leader just ahead of the hook. When you’re fishing with night crawlers, injecting a bit of air with a product like Lindy’s Worm Blower will help float the crawler up higher to reach these fish. Don’t over do it, a tiny bubble of air injected near the collar will do the job and still allow the bait to look natural. Sinker weights are another important element. I grew up in the era when everyone preached and pounded into my head that rigging for Walleyes was always to be done with light sinkers and tiny hooks. This heavy emphasis on finesse is a good philosophy for shallower water, but it was working against me when I fished deeper. It took my friend Joe Thompson, a seasoned Lake Winnibigoshish launch captain and director of fishing at Four Seasons Resort, a couple of years to convince me that heavy egg sinkers fished directly below the boat, will always work better in deep water. It makes sense when you think about it, you already have the fish spotted on your graph, so the only problem is keeping the bait right there in front of them. Fishing vertically using a heavy sinker walked along the bottom allows us to follow the exact track of the boat and keep the bait in front of the fish. With lighter weights, we’re forced to feed out more line to maintain bottom contact and it can become impossible to know where your bait is in relation to the fish. In water 20 to 30 feet deep we will use ½ ounce, ¾ ounce or even heavier sinkers depending on the wind conditions. Heavier weights are also a must when you’re trying to keep several anglers organized and tangle free. With each rig riding comfortably in it’s own territory, tangles and snags are much less likely. It might be old technology, but it really works! An assortment of leaders and a handful of bullet, egg and walking sinkers and you're in business. This kit covers 99% of my rigging needs. Mix and match to suit your situation. Shallow water rigging, especially in weeds or on rocks is where the finesse method shines. Small bullet style sinkers will wiggle and worm their way through the weeds much better than the heavier egg or bottom walking type sinker. Weights as light as 1/16 ounce can be easily fished as you move the boat slowly. Leader lengths should generally be shorter; in fact we’ve had excellent results with one-foot long leaders fished almost directly on the bottom. These light weight sinkers will also perform better on rocks because you can help prevent the sinker from wedging down into the crevasses by using a lift up, drop back motion while you gently wiggle or "wag" your rod tip to keep the sinker skidding along the rocks surfaces. It’s important to match your fishing rod to the presentation because rods that are well suited for these heavier sinkers, are usually too powerful for the lighter baits used in shallow water. The perfect rod for rigging has a tip section soft enough to allow a cushion during the time the fish initially picks up your bait. Too stiff at the tip and the fish gets an early warning and drops the bait. Too soft at the tip and it might be tiresome to hold that rod with a heavier sinker. So during the rigging season, I always have two rods rigged up for each angler, one for deep water and another one for shallower water. The deep-water rods are generally longer and have more backbone. My personal choice for this is the G.Loomis, WRR8400S. The extra length allows for a tip soft enough to act as a cushion, but there is also enough backbone for holding up the heavier sinkers. For shallow water and lighter sinker weights, there are a number of good choices, but I use the G.Loomis SJR720 for this job. 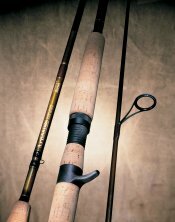 This rod is versatile, reliable and has been a mainstay for me over the years. Matching your rod to the fishing situation makes all the difference in rigging. Longer rods with good backbone and soft tips are good with the heavier sinkers used when fishing deep water. Lighter rods are better in the shallows with small sinkers. Colors have become one of the new frontiers in fishing tackle. All varieties of hooks and sinkers are now available in a wide range of colors including fluorescent and phosphorescent (glow in the dark) versions. I have seen times when colored sinkers or hooks have made a huge difference and other times when it’s hardly been noticeable. Experimentation can pay off big time and I do believe it’s a great idea to keep trying different combinations throughout the day. A slight variation can be enough to trigger a couple of extra bites at times when the fish seem to have turned off or become complacent about your old standby. When the fish takes the bait, it’s almost always necessary to feed line to allow time for the fish to fully inhale it. This can be one of the pitfalls of rigging, especially where releasing the fish is desired or lawfully required. Here are a few tips that will help keep fish in healthy, releasable condition. Avoid over feeding; allow the fish only enough time to get the bait in its mouth. I always test my first couple of bites to see if the fish can be caught without even feeding line at all. You’d be surprised how often this works, especially with leeches or smaller minnows. Avoid "power hook sets"; in rig fishing you’ll catch more fish and they’ll be in better condition if you remember to reel up all of the slack line until you can feel the weight and movement of the fish. As the sensation of pressure increases, set the hook by smoothly lifting the rod to remove the final bit of slack line. This will help prevent any unwanted damage that could be caused by the hook ripping the throat during the set. If you have caught a fish that swallowed the hook, use the correct tool to remove it and be prepared to cut the hook if needed; A deeply hooked fish can still be released if you avoid further damage during the hook removal. A quality pliers like a "Curved Kelly" type medical clamp will allow you to grip the hook at the bottom of it’s curve and gently turn it back out. Never try to remove a hook by pulling on the line or trying to pull on the hook from the top. Finally, if the hook isn’t visible or can’t be gripped from the curve, cut it off. The fish has a much better chance this way. Last but far from least. Bait must be fresh and lively. This is no time to skimp on the bait budget and it’s where your choice of bait shops really makes a difference. Folks who run a quality shop know the difference between garden-variety bait and the really good stuff. The better shops will help you select the right size and type of bait for the conditions you’ll be facing. Take the time to make a few stops and get to know the folks who run the shop. Once you get aquatinted, they can save you a lot of time by suggesting alternatives and directing your attention to area trends at the time.